Planes, trains and automobiles. None of them are acceptable for Markus Pukonen's human-powered trip around the world. Call it "around the world in 80 ways." Markus Pukonen of Toronto is making an attempt at circumnavigating the earth on canoe, bike, handcycle, and even pogo stick — any vehicle powered by his own muscles. No motors allowed is the rule of his trip. Pukonen started his five-year journey in Toronto on July 13. On his way to B.C. 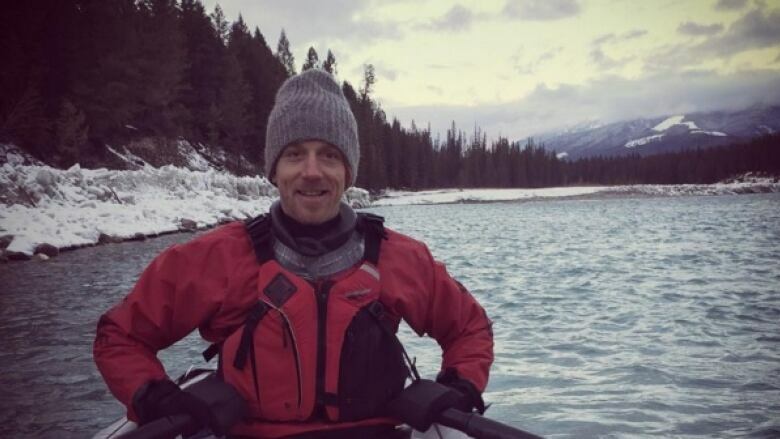 's interior, he has sailed across Lake Ontario, rode a recumbent bike across the Prairies, skied through the Rocky Mountains and kayaked through the Kootenays. He also pogo sticked his way through urban Winnipeg. "I thought it was going to be the hardest most painful part of the whole trip, but something about hopping through the city made me smile and made my body feel good," he told Daybreak South host Chris Walker. Pukonen is doing the trip on behalf of his non-profit, Routes of Change. The stated mission is to raise $10 million to be given to those leading the research on ways to make the world more sustainable. He says that his next challenge is his trip across the Pacific Ocean, which will be completed with a 30-foot sailboat. Pukonen says if nothing else, the trip is getting him to re-think distance in a world where international flights can get you across the world in mere hours. "I look at travelling 50 kilometres in a day like it's nothing — until I'm 40 kilometres into the day and I realize that it's actually quite a long distance and I'm pretty exhausted!" he said. "I am getting into better and better shape as I go. And distances are getting smaller, even though I still have about 75,000 kilometres to go."